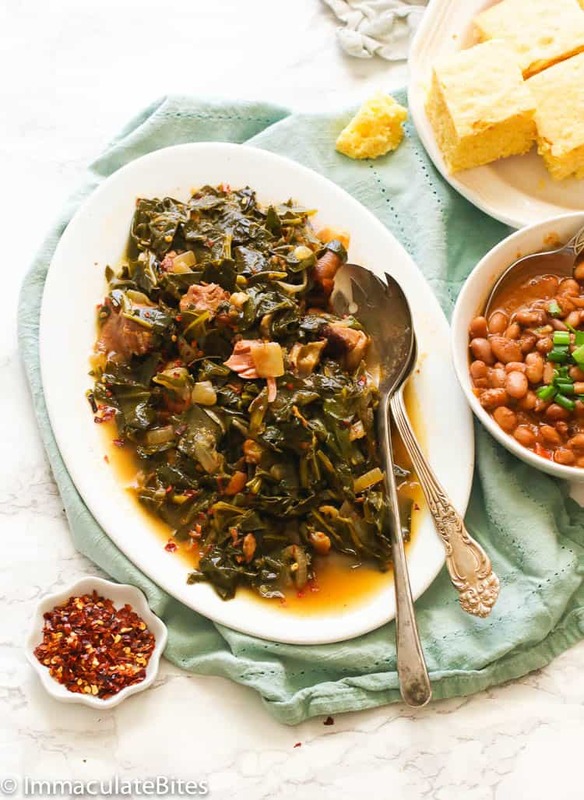 Collard Greens Recipe – Southern-style Collard Greens slowly simmered in a flavorful and spicy broth loaded with ham hocks and spices. A flavor-packed take on your favorite greens. Collard greens are a type of a thick, slightly bitter, edible leafy green vegetable commonly used in U.S. Southern cooking and in many parts of Africa (known as sukuma wiki in Tanzania and Kenya). It has dark green leaves with tougher stems and of the same group with kale, turnips, and mustard. The name “collard” itself is derived from the word “colewort” or the wild cabbage plant. They are available year-round and is said to be tastier and more nutritious in the cold months. No wonder it always makes an appearance in Southern households during the holiday season. Holidays would never be the same without it! And yes it’s a great way to kick off the New Year. How long to cook collard greens? Cooking collard greens certainly takes time. But I can guarantee you, it’s worth all the wait knowing how nutritious they are and delicious especially when paired with smoked meat. After you trim off the stems, you need to thoroughly wash them first before cooking. Then chop them into 1-inch pieces or so and cook them until tender in a well-seasoned broth around 45-60 minutes along with the turkey and/or ham hocks. 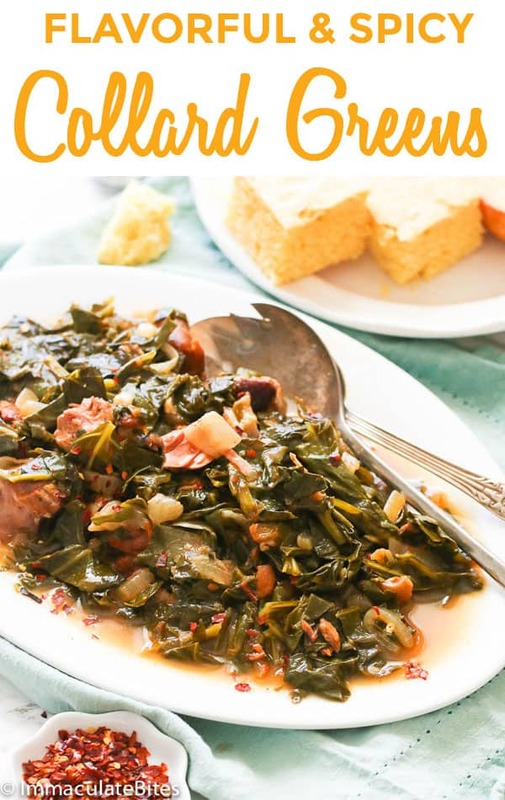 Southern greens and ham hocks is the ultimate side dish. The greens themselves are super tender and the flavor is just incredible. Starting the dish with onion, and garlic as the base and then cooking smoked turkey and ham hocks in chicken broth, creates a very tasty cooking liquid for the greens. The smokiness infuses the broth with that deep, complex taste and the turkey meat certainly doesn’t hurt. I like to use both ham hocks and smoked turkey. And though it might not be a traditional one, but if you have some chicken you can certainly throw it in. As you probably know, smoked meats pack a punch of flavor. It slowly cooks with the rest of the ingredients until it literally falls-off-the-bone. As for the greens themselves, they have a naturally bitter taste which is why making a delicious liquid to cook them in is a must. That bitterness is nice but it has to be accompanied by smokiness, a little heat, salt and some protein to make your mouth water. As the greens cook and their fibrous texture turns into tender goodness, they absorb every layer and nuance in the broth. Soon enough, they are a hearty and soulful side that happens to be nutrient dense. In other words, everything about this recipe works. 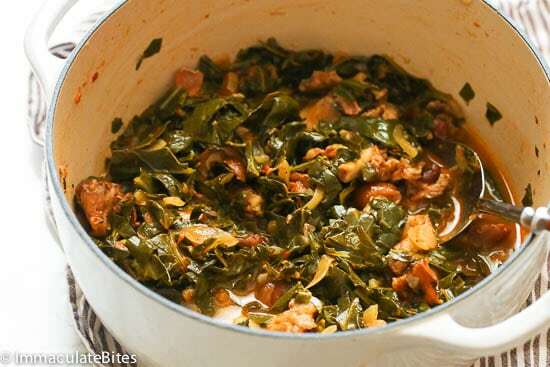 Braising the collard greens softens them just enough while avoiding that dreaded mushy texture. They retain some of their bitterness which is complimented by that ham hocks enhanced liquid and you get juicy bites of meat as well. This side goes with a number of main courses and can be eaten alone. 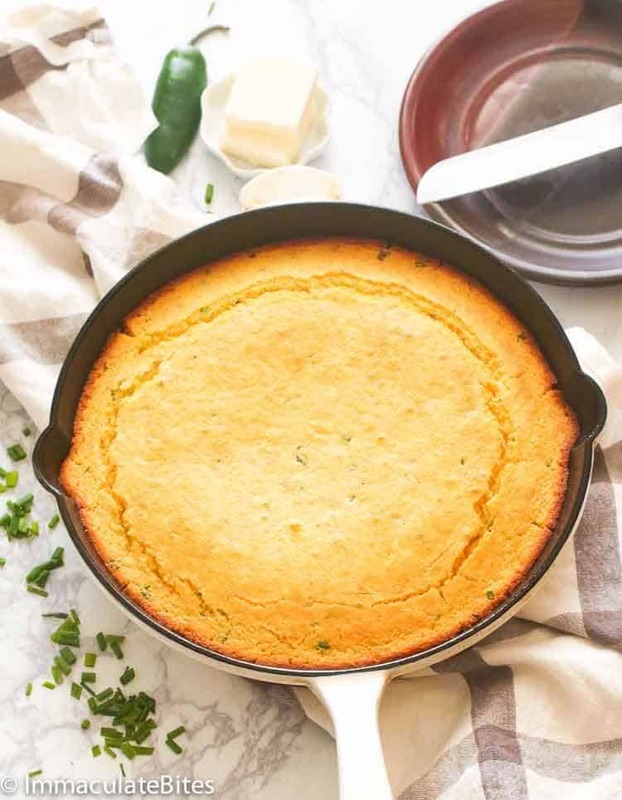 You can also pair it with this Pinto Beans Recipe OR this super moist, buttery Skillet Cornbread with THE perfect crumb and crispy edges. A MUST and a perfect match to this green recipe. For the health conscious switch out the ham hocks in place of smokey turkey . It’s healthier and takes less time to cook. Collard greens turn to have a lot of dirt trapped all over the folds of it’s leaves. So it’s best to wash them thoroughly – soaking them in salt water . Or rinse your leaves individually by placing them under water to wash away dirt.Remove each green leaf individually from the colander. Discard old leaves with large patches of yellow and/or brown . .
Chicken bouillon adds more flavor to this humble dish , so don’t be shy about it – adjust to taste. Lemon or vinegar helps cut down on some of the bitterness and adds some sweetness to it. This post was first published on September 2016 and has been updated with new photos and write up. 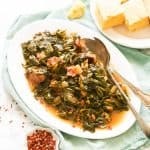 Collard Greens Recipe - Southern-style Collard Greens slowly simmered in a flavorful and spicy broth loaded with ham hocks and spices. A flavor-packed take on your favorite greens. Start by boiling the ham hocks in pot fully covered in water , bring to a boil then lower heat and boil for approximately 11/2 - 2 hours or until meat falls off the bone . The best and easy way to do this is to use a pressure cooker . It's faster and takes me only about 12 minutes or less once it starts cooking . Let it cool then cut the meat into bite size pieces . Remove collard green leaves from the stem. Then wash, rinse and chop. Repeat until all the collard greens have been removed from it’s stem. Discard stem and reserve chopped leaves. Heat up a medium or large dutch oven . Then add chopped bacon, cook for about 6-7 minutes or until brown. Add about 1 tablespoon oil - there should be about 2 tablespoons grease in the pot . Add onions , garlic , ham hocks, and sauté for about 3-5 minutes. Throw in tomatoes, paprika , creole seasoning and some pepper flakes. Sauté for another about 2 minutes. Finally add collard greens , chicken bouillon and lemon . Pour in chicken broth or water - lightly salt , if desired . Or wait till the last few minutes of cooking . 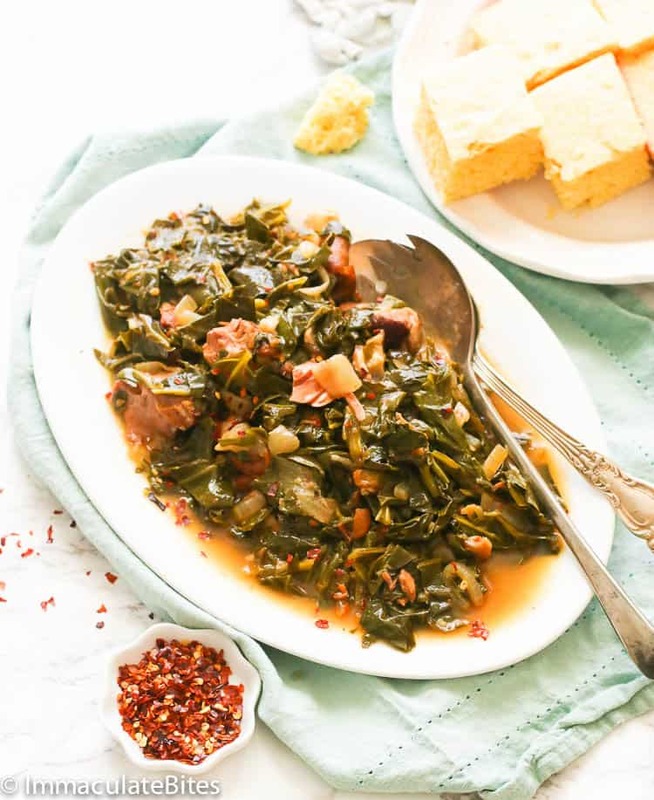 Bring to a boil and simmer for about 45 minutes or more or until collard greens are tender . Serve warm with hot sauce and cornbread. 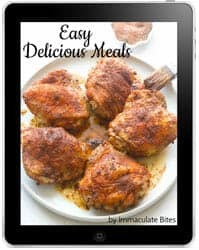 Start by boiling the ham hocks in pot fully covered in water , bring to a boil then lower heat and boil for approximately 11/2 – 2 hours or until meat falls off the bone . The best and easy way to do this is to use a pressure cooker . It’s faster and takes me only about 12 minutes or less once it starts cooking . Let it cool then cut the meat into bite size pieces . Heat up a medium or large dutch oven or pot . Then add chopped bacon, cook for about 6-7 minutes or until brown. Add about 1 tablespoon oil – there should be about 2 tablespoons grease in the pot . Add onions , garlic , ham hocks, and sauté for about 3-5 minutes. Throw in tomatoes, paprika , creole seasoning and some pepper flakes. Sauté for another about 2 minutes. Finally add collard greens , chicken bouillon and lemon . Pour in chicken broth or water – lightly salt , if desired . Or wait till the last few minutes of cooking . I would like your honest opinion so that this turns out as good as possible. What do you think of reserving the liquid from boiling the ham hock, and using that in place of chicken broth/water? Do you think that would be good, or do you think sticking to the recipe would come out batter. Thanks! Please tell me how can I cook this without pork ? My husband loves greens I would love to make this recipe. You can use smoked turkey instead of pork- omit the bacon. You can just cook it with the chicken bouillon. Great taste! How much chicken bouillon can I add to this recipe. My new favorite website! Imma, I’m from Memphis and my parents are from Mississippi so I’ve been cooking and eating my grandmothers greens my whole life. I fixed your recipe for New Year’s Day good luck today and they are so stinking good! next year I’m making those black eyed pea fritters I just saw! That’s wonderful to hear Jennifer! Thank you for letting me know you enjoyed this. Am sure you are going to enjoy the Black-eyed peas too . Happy New Year ! Hmm I like it! Already like things that’s slow to simmer and develope nice Flavors over time. It’s just about Collar Green seasons anyway too and for it to be all over the place. I’ll make some time to put this one on my Short Menu. But it looks awesome and luv the Flavors. Like the styling too! 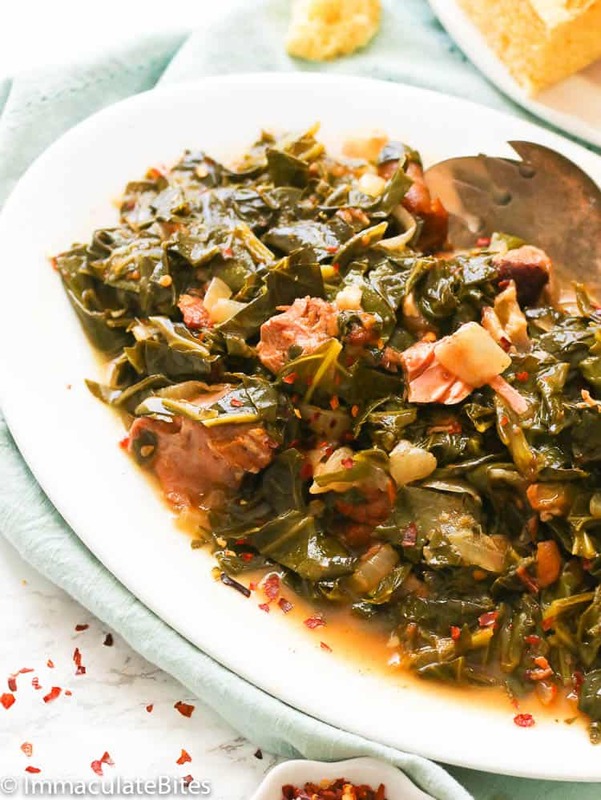 I love all the layers of flavor you cooked into those collard greens. That’s Southern comfort food at its finest. This looks so comforting and delicious! The corn bread muffins would go perfectly! Love the African style stew spinach. Thanks for the recipe.I usually add a little bit of ground melon seeds. Oh ya,baby. You nailed this one. 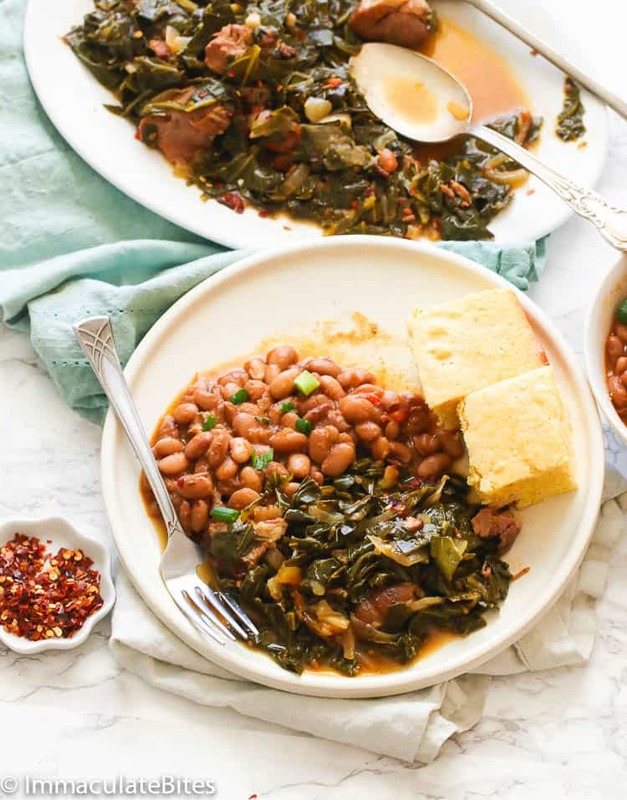 I love greens, your recipe and cornbread, too! Thanks. This looks spectacular. Adding ham hocks gives anything such a major flavor upgrade. I would be totally happy making a dinner of this alone!